Trump’s attacks on the Khans aren’t surprising. We know there’s no low he won’t hit. But now Republican leaders are going down with him. Back in December, when Donald Trump proposed his ban on Muslims’ entering the United States, I wrote a piece called “Donald Trump’s Bottomless Bottom.” There was no depth he wouldn’t sink to, it seemed—and, sadly, it also seemed there was no abomination for which his loyal primary supporters would punish him. Trump had already called Mexicans who illegally entered the country drug dealers and “rapists,” questioned former-prisoner-of-war Senator John McCain’s hero credentials—“I like people who weren’t captured,” he needled—and led a crusade against popular Fox News host Megyn Kelly, blaming her tough debate questioning on her menstrual cycle. As Trump kept diving for the bottom, he kept rising in the polls. To their credit, many of Trump’s rivals for the GOP nomination, having let his earlier remarks slide, criticized his anti-Muslim jihad. “Banning all Muslims will make it harder for us to do exactly what we need to do, which is destroy ISIS,” Jeb Bush said at a debate the next week. “We need to engage with the Arab world to make this happen.” But as we now know, more than two-thirds of GOP primary voters agreed with Trump’s stand, and he won the primary. I was right about Trump’s bottomless bottom; his Muslim ban proposal wasn’t disqualifying. Nothing has been, yet. But now he’s dragged the whole Republican Party down to a new bottom with him. His attacks on the Muslim parents of Capt. Humayan Khan, who was killed in Iraq by a suicide bomber in 2004 while saving many in his unit, have been despicable. 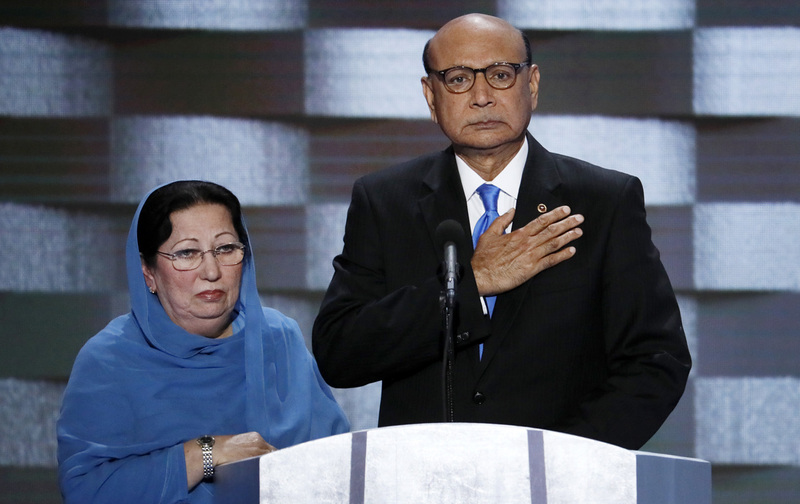 Khan’s father, Khzir, was the soul of the Democratic National Convention, railing against Trump for wanting to bar people like his medal-winning son from the country, and offering to lend him his pocket copy of the US Constitution, since it seems obvious Trump hasn’t read it. “You have sacrificed nothing, and no one,” Khan told Trump, and his words rang through the convention hall. They are still ringing this week. Predictably, Trump struck back. But maybe less predictably, while GOP leaders rebuked Trump—running mate Mike Pence called Captain Khan “an American hero”—not one of them withdrew their endorsement of the divisive, disrespectful bully. Hilariously, a Trump aide reached out to Capitol Hill seeking members’ support for his boss in his feud with the Khans. He reportedly got no response. On Tuesday morning, Representative Richard Hanna, R-NY, became the first House member to announce that he would support Hillary Clinton. “For me, it is not enough to simply denounce his comments: He is unfit to serve our party and cannot lead this country,” Hanna wrote in an op-ed. But the pro-choice congressman is retiring this year; his party’s leaders have been unable to show the same spine. Trump, of course, took a different tack. First he suggested that Ghazala Khan, the captain’s mother, was “not allowed” to speak, presumably by Muslim custom (though she was already on record saying she could not speak as she was overwhelmed by grief merely looking at pictures of her late son). Then he denied Khan’s claim that he’d made no sacrifices. “I’ve created thousands and thousands of jobs, tens of thousands of jobs, built great structures. I’ve had tremendous success,” he told ABC’s This Week on Sunday. And then he took to Twitter. Mr. Khan, who does not know me, viciously attacked me from the stage of the DNC and is now all over T.V. doing the same—Nice! Asked by CNN to reply to Trump, Khan replied: “I really want to keep my family’s dignity.” He went on to suggest that Trump lacked a trait required by “great leaders”: empathy. But again, Trump’s response was predictable. The craven have-it-both-ways reaction of Republican leaders was less so. Senator John McCain came out with a long and scathing denunciation of the GOP nominee. “While our Party has bestowed upon him the nomination, it is not accompanied by unfettered license to defame those who are the best among us,” McCain said in a statement Monday. “I’d like to say to Mr. and Mrs. Khan: thank you for immigrating to America. We’re a better country because of you. And you are certainly right; your son was the best of America, and the memory of his sacrifice will make us a better nation—and he will never be forgotten.” Reading McCain’s increasingly fiery statement, it was natural to expect he would conclude it by withdrawing his Trump endorsement. He did not. It went on like that all of Monday. Senator Marco Rubio, once a Trump opponent, said this: “I think [Khan’s] parents are heroes and they have a First Amendment right to speak out on their politics, as all Americans do. Their son died for the Constitution and I honor that.” He too left his endorsement intact. On Friday night on MSNBC, Khizr Khan praised House Speaker Paul Ryan and Senate majority leader Mitch McConnell as honorable men, and begged them to denounce Trump’s remarks. The next day Ryan did so—without mentioning Trump. “As I have said on numerous occasions, a religious test for entering our country is not reflective of these fundamental values. I reject it. Many Muslim Americans have served valiantly in our military and made the ultimate sacrifice. Captain Khan was one such brave example. His sacrifice—and that of Khizr and Ghazala Khan—should always be honored. Period.” It was a milder reaction than Ryan has had to Trump in the past, when he called Trump’s attacks on a judge of Mexican descent “the textbook definition of racist.” McConnell likewise condemned the remarks without mentioning Trump. Despite all of the GOP agita over Trump’s attacks on the Khans, only one person of note, besides Richard Hanna, announced that they’d ditch Trump, and the party, over it. That was Sally Bradshaw, a Bush/Romney adviser who said on Monday that she was leaving the GOP, and she would vote for Clinton if the race seems close in Florida. That’s laudable of Bradshaw, but it just underscores the spinelessness of GOP elected officials who know they must denounce Trump’s attacks on the Khans, but who refuse to denounce him. Bradshaw was also the co-author of the Republican National Committee “autopsy” examining Romney’s defeat and prescribing a better way forward—a way that included more friendliness to Latinos, women, and young voters. It was, of course, DOA. When this race is over, and Clinton (as polls show is most likely) becomes president, there will be another “autopsy” to explain why the GOP lost the popular vote for the sixth out of seven times, going back now 25 years—but they won’t have Bradshaw to write it this time. Of course, many leaders will blame Trump, when they really ought to look in the mirror.